Spike Lee bounding into the arms of Samuel L. Jackson, and trading shout-outs to Brooklyn (and hats!) with Barbra Streisand. A weeping Lady Gaga in her elegant up-do, extolling the virtues of hard work. A stunned Olivia Colman and her delightfully daft acceptance speech. Historic breakthroughs for winners of color, and for women. Yes, the hostless Oscars at first threatened to be a rather antiseptic affair, but the brisk-moving ceremony soon came alive with genuinely moving feel-good moments and heartwarming surprises — though it finished on a decidedly unsettled note with a best-picture win for the divisive segregation-era drama "Green Book." It was a great night for diversity at the Oscars, thanks in part to the groundbreaking Marvel film "Black Panther." Celebrated costume designer Ruth E. Carter won for her vivid, futuristic designs, the first black winner in the category, and moments later Hannah Beachler became the first black winner (and nominee, too) in production design. "This has been a long time coming," mused Carter, who thanked the academy for honoring "the empowered way women can look and lead onscreen." As for Beachler, she gave a deeply emotional speech, singling out the ways she had become stronger. "I give the strength to all of those who come next to keep going, to never give up," she said. Carter also thanked Lee, with whom she worked on the 1992 "Malcom X," and soon Lee himself was onstage, accepting his award for best adapted screenplay for "BlacKkKlansman." It was perhaps the feel-good moment of the night as the director, who'd never won a competitive Oscar, leaped up into the arms of presenter Jackson. His speech touched on Black History Month, Jamestown, and his own grandmother, "who called me Spikey-poo," and used her Social Security checks to put him through school. He ended with a political call to arms: "Let's all be on the right side of history," he said of the presidential election. "Let's do the right thing!" It wasn't just Lee's grandma who came in for special praise. Best supporting actor Mahershala Ali dedicated his second Oscar to his own grandmother, "who has been in my ear my entire life, telling me that if first I don't succeed, try try again, that I could do anything I put my mind to." And if it wasn't Grandma, it was Mom. Best supporting actress Regina King brought mother Gloria as her date, and thanked her tearfully "for teaching me that God is always leaning in my direction." Best actor Rami Malek also pointed out his mom as he accepted his award for "Bohemian Rhapsody," saying, "I love you, lady." Carter, winning her costume award, called her own 97-year-old mother "the original superhero." Best actress nominee Yalitza Aparicio brought her mother as her date, at one point introducing her to actor Diego Luna. Not to be outdone, while closing the show presenter Julia Roberts thanked her children — and "Bradley Cooper's mother." A record number of women took home Oscars on Sunday — 15. It had been a record year for female nominees, too. But that doesn't mean the picture is entirely rosy. After all, none of this year's nominated films for best picture had a female director. And there's still the glaring statistic that only one woman has won best director in the history of the Oscars: Kathryn Bigelow. And only five have been nominated, including none this year. So there may not have been an actual Oscar host giving regular comic asides, but Melissa McCarthy delivered a huge laugh just when it was needed. 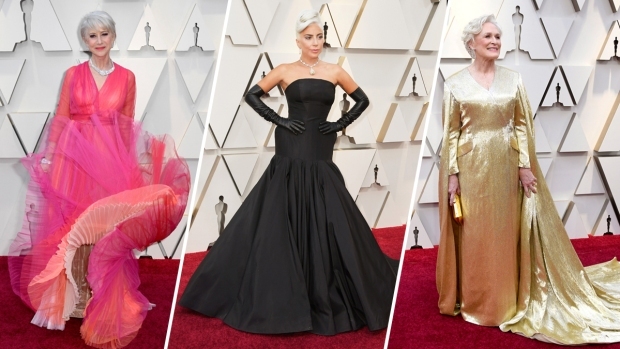 Presenting the costume award along with Brian Tyree Henry, McCarthy, a nominee for best actress, appeared in an elaborate royal get-up, channeling Olivia Colman's Queen Anne in "The Favourite," including a cape embellished with stuffed rabbits — a reference to the queen's beloved pets. The two actors dryly hailed costume designers for their "nuance and sophistication," and also for "never distracting from the story." This, as McCarthy wrestled with a stuffed rabbit on her hand that prevented her from opening the envelope. In the night's most stunning upset, it was Colman, and not the heavily favored Glenn Close, who took the best actress trophy for her blazingly eccentric turn in "The Favourite." The British actress then proceeded to charm the audience — and the world — with a tearful yet goofy acceptance speech. "Ooh, this is genuinely quite stressful," she began, adding that it was "hilarious" that she had an Oscar. Her delightfully daft remarks got better and better, culminating with a random gush: "LADY GAGA!!" While the lady herself didn't take home the actress prize for "A Star Is Born," she did get her Oscar, for the addictive song "Shallow," which she performed with co-star and director Bradley Cooper. Gaga was weeping with joy as she accepted the award along with co-writers Mark Ronson, Andrew Wyatt and Anthony Rossomando. After thanking Cooper for believing in her, she gave the kind of inspirational talk she's become known for on the awards circuit : "If you are at home and you're sitting on your couch, and you are watching this right now, all I have to say is that this is hard work," she said. "I've worked hard for a long time, and it's not about winning. But what it's about is not giving up." This was definitely not the first rodeo for Mexican director Alfonso Cuaron, who'd already won the best director prize for the 2014 "Gravity." With this year's much-lauded and highly personal project "Roma," he picked up another directing award and the cinematography prize, but "Roma" also won the foreign language award, a first for Mexico. "I grew up watching foreign language films and learning so much from them and being inspired," Cuaron said, noting slyly that they included "Citizen Kane" and "Jaws" and "The Godfather." Despite his growing Oscar haul, Cuaron remarked with a smile: "It never gets old being up here."